With design/install/build capabilities, CPS is your one-stop solution for compliance with the new ADA requirements. You can count on Chester’s experience and expertise to provide the best solution for your facility. Capabilities CPS offers full-service Design/Build/Install capabilities for one-stop assistance in compliance with the latest ADA accessibility requirements. CPS utilizes factory-dispatched crews to ensure that the work is done to the highest standards. Your Pool While the compliance requirements have been spelled out, there is no one-size-fits-all solution. Numerous factors including pool size, shape, depth, use, and facility layout must be considered. Each pool should be individually evaluated to determine the optimum approach to compliance. Your Options In addition to a choice of compliance solutions, in some cases federal money may be available to help pay for the modifications. The sooner you get started, the more time you have to explore the options and resources available to you. Your Schedule By planning early, you can schedule any necessary modifications for the most convenient, least intrusive portion of your annual schedule. By not waiting until the last minute, you avoid the expenses associated with expedited construction and installation, plus loss of income due to interruption of services. Confidence No one knows your Chester Pool like CPS. 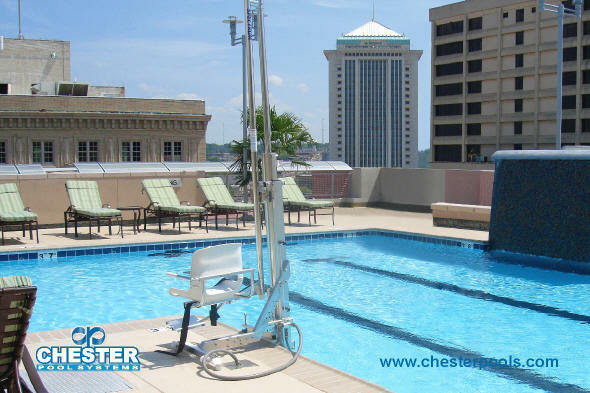 CPS maintains the design and construction documents for your Chester pool and is in the best position to help evaluate and guide compliance solutions.